Divinity (AKA: Damnation) | Who Are You Calling Crafty? Every year growing up my grandmother would make divinity, every year my aunt and I would tell my cousins they wouldn’t like it so we could eat their share (it worked too!) 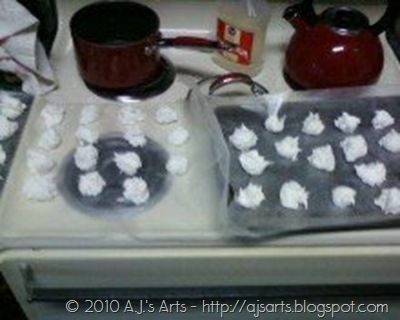 The first year Christmas I decided to bake cookies for friends I wanted to make divinity. Three batches later I called my grandma in tears because all I got was a big gloopy mess. My grandma laughed and asked a very simple question, “Did you add Cream of Tarter with your eggs?” “No, my recipe doesn’t call for it.” My grandma said, “No recipe calls for it but with divinity you need at least a 1/4 tsp of it.” So I made the last batch and it finally turned out. Jeff says any candy that leaves you in tears attempting to make it should not be called divinity but damnation. Heat sugar, corn syrup and water in 2 quart sauce pan over low heat, stirring constantly, until sugar is dissolved. Cook, without stirring, to 260 degrees on the candy thermometer or until small amount of mixture dropped into very cold water forms a hard ball. Remove from heat. Beat egg whites with cream of tarter until stiff peaks form; continue beating while pouring hot syrup in a thin stream into egg whites. Add vanilla; beat until mixture holds its shape and becomes slightly dull (mixture may become too stiff for mixer). Drop mixture from tip of buttered spoon onto wax paper.